The Russian Tortoise, which is the name it is usually known by, was named after the naturalist Thomas Horsefield. The species name of the Russian Tortoise is tortudo Horsefieldii, or agrionemis Horsefieldii. The Agrionemis Horsefieldii is a small sized tortoise; the size between the male and the female of the species varies – the female is the larger of the two, having a length of 15 – 25cm. This larger size allows the female to hold a batch of eggs inside her body. The male Russian Tortoise grows to approximately 13 -20cm. The coloration of this tortoise is a reddish brown or black, which lightens to yellow in between the scutes. The female tortoise will lay up to five eggs per clutch. Another identifiable feature of the Russian Tortoise is that it has four toes. The first and most accessible choice when thinking about where to buy a Russian Tortoise is a pet shop. As with most things there are pros and cons with this decision. A pet shop may be a clean and well-kept space for animals to live in while they are waiting to be bought or it may be dirty unkempt place in which is unpleasant, unhealthy and difficult for the animals to survive in. If pets are to be bought from a pet shop, check the reputation and the atmosphere of the shop first. A diet of pet shop food may not be the best diet for a Russian Tortoise, so it is also a good idea to find out what these animals are being fed. Checking or asking how the animal is or has been housed. Obtaining references if a tortoise is purchased from an individual buyer. Being sure to get an agreement or certificate stating that the animal is in good health and that it will be handled carefully if it is being sent from a distance. Checking the tortoise’s condition. This may include checking the eyes, the breath, the carapace and scutes, the nose, the feet and the tail of the tortoise. 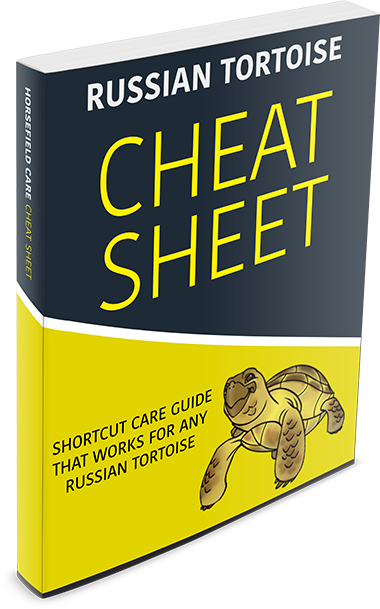 Whatever method has brought a Russian Tortoise into the home to be kept as a pet, it is very important to be well-informed about this finicky and refined little animal in order to give him/her the best care possible. 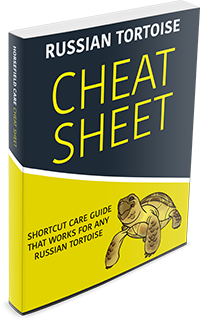 As a first step, it is usually a good idea to take the tortoise to a vet for a check-over. The vet will know if the tortoise has any hidden parasites or diseases as well as weighing and measuring it so that its growth and health can be recorded. The Russian Tortoise is an herbivore; its diet consists of leafy greens, flowers and weeds. Water is also a very important element in this creature’s diet. This tortoise eliminates its waste very economically through a white semi-solid paste; this is because its original home is the dry arid steppes where it is important to conserve liquids. A tortoise still needs to drink water and it is suggested that a low-depth pan of water is placed out for a Russian to drink from; this pan must be emptied every four days or so as to eliminate the accumulation of parasites. The Russian Tortoise also enjoys being lightly soaked with water, from a garden hose or in a small pond, but it must not be kept wet continuously as this may result in shell rot. A Russian Tortoise needs an environment which gives the tortoise the ability to burrow and that allows it to aestivate, to hibernate if it wishes to, or to retire from the heat of the day. This very special pet requires a special environment to live in which is adapted to its needs. A Russian Tortoise needs to be kept fairly dry, although it needs to soak sometimes. They also aestivate or hibernate and need a space where they can retreat from the heat of a summer’s day. Don’t forget that Russian Tortoises are very active and that they will try to escape by climbing over or digging under their enclosure. The enclosure must be high enough to defeat the tortoise’s climbing skills and have a fence or something similar which has been dug into the ground by at least twelve inches. They also appreciate any living or non-living objects which can break their line of sight; Tortoises need to keep it interesting! The addition of clumps of live herbs (those that are edible by a Russian Tortoise.) logs or piles of stones will be a good sight-break for the tortoise. Another tip is that larger is always better for this tortoise as they like to move around and even hide in their enclosures. An indoor tortoise enclosure or pen can be created by purchasing a large indoor storage box and larger really is better. The lid must be kept off this box; the addition of a substrate (See below.) and a source of water and heat can make this a suitable indoor living space for a Russian Tortoise. The best option for Russian Tortoise home is an outdoor enclosure. This can be landscaped with edible plants while the outdoor environment also allows the tortoise to bask in the sun if it is not too hot. A tunnel for the tortoise’s periods of aestivation &/or hibernation is necessary. When it comes to their correct temperature and lighting, an indoor tortoise enclosure should be fitted with a basking area in which the temperature is approximately 90-95ᵒ F. At the other end of the enclosure temperatures should cool to approximately 70ᵒ F, while during the night time a Russian Tortoise will feel comfortable with a temperature of approximately 60ᵒ. 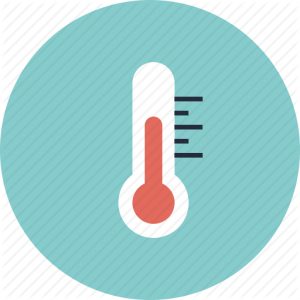 These temperatures should be fairly strictly maintained and a thermometer may be used to ascertain this. Ceramic emitters and under-tank heaters may be used as primary sources of heat. A Russian Tortoise will thrive in an environment which has twelve hours of light and an equivalent twelve hours of dark. These equivalent periods of light and dark will keep the tortoise in peak condition, whereas too much light and heat may cause aestivation; if kept in too cool a climate the Russian Tortoise will not digest its food. A full spectrum lighting system with UVB rays is a necessity – the tortoise must have a good source of the vitamin D3 in its body to keep the carapace healthy – the UVB rays help to create Vitamin D3. A tortoise that is kept outdoors will absorb vitamin D3 from the sun. There is some debate about the perfect product to use to create a healthy substrate in the Russian Tortoise enclosure. 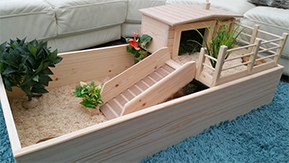 For some tortoise owners the best possible substrate is a mix of play sand and coir or loam. A mix of sand and garden soil is also well-recommended, as is an admixture of peat moss. The substrate should definitely be deep enough for a tortoise to be able to burrow, so this depth can be from ten inches up to three feet. Organic topsoil over a hay made from timothy grass or Bermuda grass is also a good option. A Russian Tortoise needs some humidity in its environment, but the substrate mix that is chosen should not be one that will easily become moldy. It is not advisable to use a substrate of a substance that holds water such as alfalfa. The Russian Tortoise is a grazer whose natural behavior is to eat large amounts of weeds leaves and flowers before returning to hibernation. This tortoise hibernates in the cold months and it may also aestivate because it is uncomfortable in high temperatures. The term aestivation refers to a semi-conscious sleep period during the summer, while the term hibernation refers to semi-conscious sleeping period during the winter. It is a good idea to grow a supply of leafy green plants if your Tortoise lives indoors. This means it will not have to depend on greens and other food from the grocery store which may have been treated with pesticides. A Calcium/D3 vitamin supplement should also be added to the indoor tortoise’s diet. Never add meat to a Russian Tortoise’s diet – these animals are herbivores and they cannot digest meat. Fruit is also something to leave off this tortoise’s menu, as consumption of fruit can cause parasite blooms. If the tortoise is living in a landscaped outdoor enclosure, do not use any of the above plants for the sake of the health of the tortoise. Make sure also to weed these plants out of the garden if the tortoise is being left free to forage for some hours during the day. 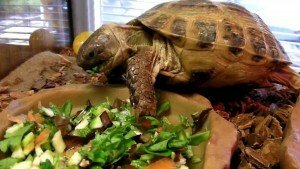 Food is medicine for the Russian Tortoise and this species must have the right diet for their needs. Substitutes such as food from the pet store are not really adequate and these foods may contain too much protein &/or not enough calcium. A lack of calcium causes the tortoise’s carapace to become completely flat rather than healthy with well delineated scutes. A lack of essential minerals may cause a carapace with pyramided scutes due to the thickening of keratin. The Russian Tortoise both hibernates and aestivates. The hibernation period is between October and March, when it is cold. This period of hibernation is followed by foraging for a lengthy meal which will help the tortoise to build up enough nutrients to last through another long period of hibernation. There is more than one reason why a tortoise will aestivate – if it too hot for a Russian Tortoise to feel comfortable, the animal will crawl into the same tunnel it uses to hibernate until the weather cools down. A lack of food or water may also cause this tortoise to aestivate, as the hibernation tunnel will usually provide high enough levels of humidity that the necessity for water will be slowed. 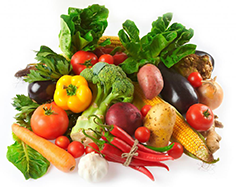 The decreased levels of activity during aestivation also reduce the need for food. A tortoise that is a domesticated pet may not experience the same cues of temperature that motivate it to hibernate, especially if it is kept indoors. Some pet-owners believe that it is not necessary for their domesticated tortoises to hibernate, because the temperature and environment can be controlled. Others believe that this natural habit should be maintained at least for two months of the year. Hibernation does cause some strain on the tortoise’s system as it must eat copiously and then slow its metabolism down to survive a long period underground, but this a natural instinct in the Russian Tortoise and they are biologically programmed to do it. If a domesticated Russian Tortoise does not appear to be in good health after its vital signs have been checked, then it is probably better not to encourage it to hibernate as poor health may not permit it to survive the winter. A healthy Russian Tortoise may automatically slow down in its eating when it is ready to hibernate. Aestivation may not be at all necessary for pet Russians, unless a heat wave has driven up the temperatures. A Russian Tortoise may commence its breeding rituals when it is large enough in size rather than when it reaches a particular age. These animals are long lived so holding back their breeding by separating the males and females, until they are older larger and healthier is sometimes beneficial for the breeding of a healthy clutch of hatchlings. Mating is not seasonal; a tortoise may breed at any time of year. The male of the Russian Tortoise species can be aggressive and a little peculiar during the mating ceremony. It will circle the female tortoise again and again, while nipping at her face and legs. While doing this his gaze is fixated on the female tortoise and he jerks his head up and down as if saying yes, yes. Finally, the male turtle mounts the female from behind, producing wild squealing sounds as he does so. If the female has become impregnated, she will lay a clutch of up to five eggs. These eggs must be kept in conditions which resemble those in the natural environment for them to hatch successfully. For a female tortoise who lives indoors a box packed with substrate mix will make a good nest for the eggs. For the tortoise who lives outdoors a large pile of sand mixed with garden soil will provide a comfortable place for the female to bury the eggs. To maintain the eggs at a temperature of 29ᵒ-31ᵒ, it will be necessary to remove them from the nest and put them into a hovabator or artificial incubator into which a small metal bucket filled with water has been placed; this will help to create a good level of humidity for the eggs to hatch in. Eggs can be packed into a container filled with moist vermiculate after they have been removed from the nest; remove the eggs from the nest extremely carefully and do not turn them over or change their position at all. It has been said that low incubation temperatures produce male hatchlings, while higher temperatures during incubation produce female hatchlings. Whether this is true or not, the eggs should hatch within 8-12 weeks given the proper care. Candling the eggs can be done in dark room to determine if they are fertile or not. The hatchlings are slow to break out of the egg and it may take them up to 2 days to complete this process even if they are using the special egg tooth which has grown in their mouth for this single purpose. If the hatchlings have a yolk sac still attached to them when they emerge from the egg, these little creatures should remain in the incubator until the sac has absorbed, giving them extra nutrients after the hatching process. During the two-week period before the turtles begin to eat, they will continue to live off the reserve nutrients from the yolk sac. To encourage the tortoises to drink after they have hatched it can be a good idea to wash them gently in a container of warm water. A healthy female tortoise may lay two to three clutches of eggs per year, although the processes of impregnation and laying can also be influenced by the environment that the tortoise lives in. 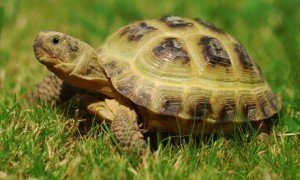 Although it demands a lot of understanding and care the Russian Tortoise, also know as a Horsfield Tortoise, is a popular pet for many reasons. Some of these are: The tortoise is simply adorable and children love them. They don’t need to be taken for walks, and they can be in hibernation or aestivation but people find their slow, yet curiously active ways cute and fascinating. The Russian Tortoise may be the only animal that eats flowers. This could be reason why they are so long lived that more than one generation in a family can enjoy their presence in the house or the garden. Seriously, it’s good to remember that dogs and tortoises don’t mix as tortoises have no way to defend themselves against a dog. Such an ancient creature as the Russian Tortoise is interesting to watch and maybe we can learn something from them about eating healthily and staying out of the heat and the cold. Russian Tortoises are threatened species in the wild due to the increasing size of the human population which reduces the number of locations where a tortoise can comfortably hibernate. Some of the wild foods that the Russian Tortoise eats are also becoming scarcer. Pet owners who try this small-sized tortoise as a pet and help to keep it from extinction may find that it becomes a favorite and that the care and attention that these creatures must have becomes an interesting project rather than a chore. Buy a Russian Tortoise today!